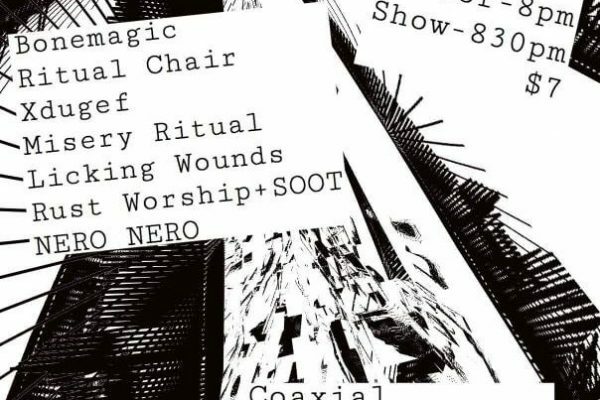 Big night of noise at Coaxial, featuring Bonemagic from Oklahoma, solo and in collaboration with Ritual Chair as Licking Wounds! Industrial-leaning stomp and blown-out EBM from Oklahoma’s Matt Hex, founder of Tulsa Noise Fest. Profoundly personal, explicitly confrontational, and meaningfully innovative PE from Hailey Magdeleno. Mysterious and otherworldly noise unit making an arcane appearance from dimensions unknown. Uncompromising brutality, both in sound and performance, from the mighty Kyle Ferguson. Matt and Hailey join forces for a rare live appearance following their recent tape on Phage. Black Horizons and Obsolete Units guys dub-out and destroy the death industrial complex for their first collaboration. Arcane industrial noise out of LA, heavy rhythmic throb and harsh execution.